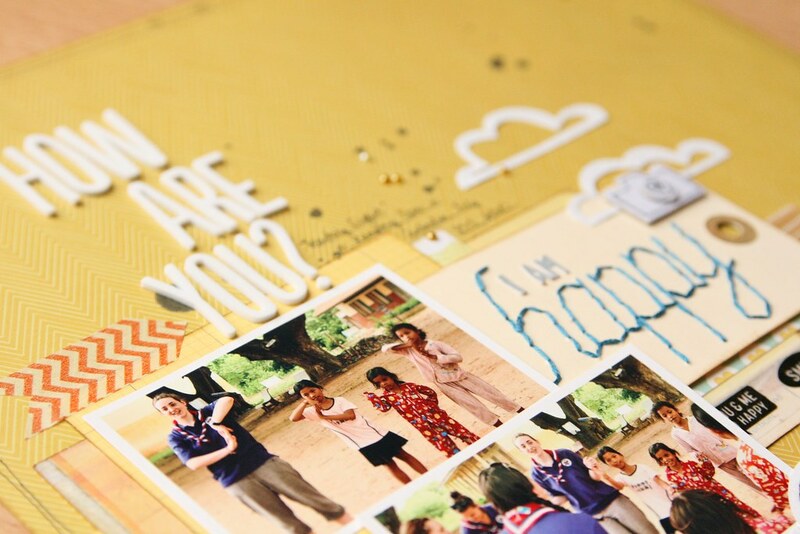 This page tells the story of our attempts to teach English to the Guides we met in Cambodia. I've already blogged this story - you can read it here - and I just wanted to do a quick post to follow up with the page! You may notice that I've referred you to a reasonably long story and then produced a page without the merest hint of a wordy ramble. Given that I'm a wordy ramble fan, you may currently be staring at your screen (or hologram if you're an archivist reading this in future) in openmouthed dismay, astonishment and disbelief. And well you might. For there is not a jot of journalling on this page. That's because I wanted to include the whole story in glorious detail, so I will write down the journalling from my blog onto a 6x12 card to go next to this page in the album. I will also include three further 6x4 landscape photos to complete the look. I'll aim to stick a picture up here when I'm done, but I'm not done yet and I find it ever so hard to take photographs of things that don't exist. Anyone else find this? But still, the page is made. And it's yellow which is a happy colour and I used up some older stash which is always a bonus. I don't love this page, but I don't hate it either, so swings and roundabouts really. Personally I prefer swings which must make this page more of a metaphorical roundabout. In the end, I just decided enough was enough and refused to mess about with it any more. I had two ideas going on for the design. I wanted to emphasise the word 'Happy' it's the whole crux of the story. So I stitched it onto a tag in a contrasting colour that makes it pop off the page. The other design idea that I wanted to incorporate was the cloud motif. I doodled and hand-cut these outlines which was a bit of a fiddle - especially cutting the middles out! - but I was pleased with the effect of the clean, stark white against the yellow. Actually, I like most of the elements of this page and would use them again, but there's something about the whole that just doesn't strike me quite right. Maybe it's the missing journalling after all. Anyway, today finds me back in London having now lost 4 ticket lotteries for Book of Mormon tickets. Alas. But the weather is sunny, I'm having dinner on the south bank with friends tonight and this wonderful city always has so much to offer that I really can't bring myself to sulk about it :D I am happy! Hope you're enjoying the sunshine! P.S. The Great British Bake Off was excellent as ever. Looking forward to next week's petit fours. I really like this layout, even if you're not totally convinced! Looking forward to seeing the 6x12 panel with the story (which I love!) and extra pictures. I just completed a 4 page spread (all divided page protectors) with lots of pictures and a reflection on the last year I spent teaching and some memories. Have a lovely evening and fingers crossed on those tickets! I like this layout. I love the yellow. It screams happy to me! I'm so glad you mentioned the great british bake off. Such a great episode. There are some real characters this year! I was just looking and thinking - where did she get those clouds from - and then you explained it. They are awesome! (A word I don't hold much stall for but use occasionally!!) 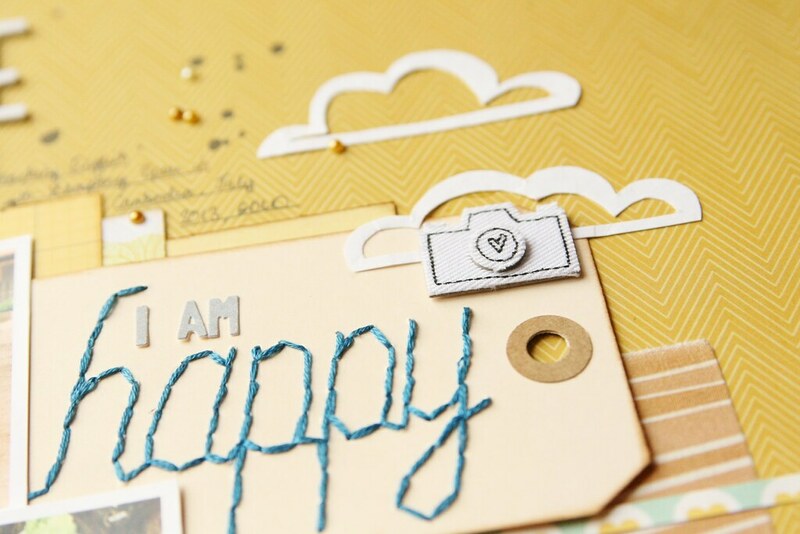 I like the washi tape you have used too to echo the happy theme. Hope dinner on the south bank was good. My dd and I are inspired to make Millionare's shortbread this weekend following the bake off - something I've never tried before!! It's a fabulous page, but I missed the journalling! I really like this too - the colour is cheering with the crisp white. I noticed the absence of journalling too but enjoyed your handwritten element just the same. Perhaps our eyes are just used to more of it, that's all! Lovely to see you posting - hope the day was delightful and good humoured! How are you? I AM HAPPY!